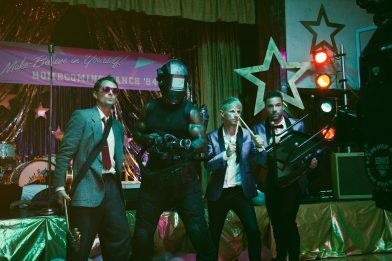 Muse have today released their new single Pressure, the latest track from their upcoming album Simulation Theory. The brand new album is due for release on November 9. Continuing their collaboration with director Lance Drake, this video also draws upon a classic pop culture moment from the 80s. Pressure centers on a high school dance that goes awry and features a guest appearance by Terry Crews. The band has announced initial cities for their 2019 world tour with more cities to be added. UK shows include London, Bristol and Manchester. In Europe the band will play in Paris, Madrid, Milan, Lisbon and Moscow and many more across Europe. Their North American dates will see the band play gigs in cities including New York, Las Vegas, Atlanta, Philadelphia, Toronto and Washington. Full details are listed below with further shows to be announced. Anyone buying Simulation Theory through the band’s store will get early access to tickets for the 2019 tour. Muse’s new album Simulation Theory will be released in three formats: Standard (11 tracks), Deluxe (16 tracks), and Super Deluxe (21 tracks). The expanded tracklisting features an acoustic gospel version of ‘Dig Down’, The UCLA Bruin Marching Band feature on ‘Pressure’, a live version of ‘Thought Contagion’, acoustic versions of several tracks, including ‘Something Human and ‘Alternate Reality’ versions of ‘Algorithm’ and ‘The Dark Side’. Simulation Theory follows Drones, released in 2015. Since then the internationally acclaimed three piece have toured extensively, taking the ground breaking ‘Drones World Tour’ to fans across the globe. This concert was filmed and released in cinemas worldwide for ‘One Night Only’ in July 2018. Muse is Matt Bellamy, Dominic Howard and Chris Wolstenholme. Their last studio album, Drones, was released in June 2015 and debuted at No. 1 in 21 countries around the world including their first No. 1 album in the United States. The album went on to win the Grammy Award, their second, for Best Rock Album in February 2016. Since forming in 1994, Muse have released seven studio albums selling in advance of 20 million albums worldwide.